"The extent of this table for the positive values of m is not so great as I would wish; but it goes far enough to enable us to point out the most remarkable circumstances of the distribution of illumination." Fig. 1 compares Mie theory and Airy theory for the primary rainbow for x = 1000 and n 1.333. Fig. 1 demonstrates that Airy theory provides a good approximation of the general features of the primary rainbow, such as the broad maximum around 139° and the maxima of the supernumerary arcs around 141.1°, 142.6° and so on. The ripples on the Mie theory calculations are due to interference between the p = 2 rainbow rays (which have suffered one internal reflections within the sphere) and p = 0 rays (which are reflected from the exterior of the sphere) - as explained here. As the calculations using Airy theory only concern the effects of p = 2 rays, it is perhaps rather unfair to complain that Airy theory does not reproduce the ripples predicted by Mie theory. It is probably fairer to compare Airy theory with calculations using Debye series for a specific value of p (such as p = 2 for the primary rainbow) - as shown below in Fig. 2. Fig. 2 shows that Airy theory agrees very closely with the results provided by the rigorous Debye series - despite the relative simplicity of the Airy calculations. However, Airy theory miscalculates the scattering angles for the maxima and minima of the supernumerary arcs above 142°. Fig. 3 extends the comparison to the secondary rainbow (p = 3). In this case, Airy theory is quite accurate in predicting the principal maximum around 127.5°, but much less accurate for the supernumerary arcs - in terms of scattering angles and intensity. Similar comparisons of Airy theory and the Debye series for higher order rainbows (p = 4, 5 and 6) are shown in Figs. 4 - 6 respectively. In each case, Airy theory seems adequate for calculation of the principal maximum, but much less accurate for the supernumeraries. Of course, "monochromatic" rainbows caused by illumination of a sphere by light of a single wavelength do not correspond to the popular notion of coloured rainbows. It is therefore appropriate to examine the performance of Airy theory in predicting natural rainbows (i.e. those due to the scattering of sunlight). Figs. 7 and 8 show the results of calculations using Mie theory and Airy theory. Mie theory predicts that Alexander's dark band between the primary and secondary rainbows will be much brighter than that predicted by Airy theory. This discrepancy can be understood by examining Fig. 9 below, which uses the Debye series to demonstrate that contributions from p = 0 rays are dominant in this region. For parallel polarisation, there are some minor errors on the primary rainbow - but much more significant errors on the secondary rainbow. In practice, these errors can probably be ignored because the rainbow caused by perpendicularly polarised light is much stronger. The coloured bars above Figs. 7 and 8 representing the visual appearance of the rainbows are effectively identical, except that Airy theory slightly misplaces the supernumerary arcs above 145°. As outlined by Lee (5), an excellent method of comparing Airy theory with Mie theory is to plot "Lee diagrams" (which are described elsewhere on this web site). Figs. 10 and 11 are Lee diagrams showing primary rainbows caused by sunlight falling on water drops for r between r = 10 µm and r = 1000 µm. Comparison of Figs. 10 and 11 shows very close agreement between the results obtained with Mie theory and Airy theory. Nevertheless, there are some subtle differences, such as the dark gaps between the supernumerary arcs (e.g. near 142° for r = 50 µm) being darker and more clearly defined when using Airy theory. Fig. 11 is not as accurate than Fig. 10 - but Fig. 11 was computed in less than 2 hours, whilst Fig. 10 took almost 1 week! 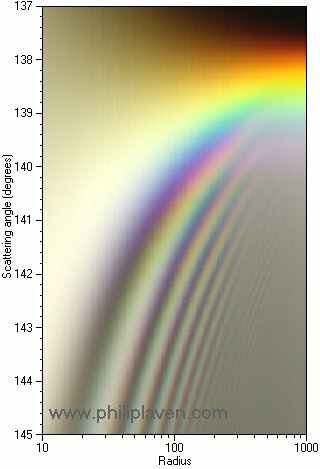 Airy theory can be successfully used to model scattering in the vicinity of rainbow angles - at least for the primary (p = 2) and secondary (p = 3) rainbows. However, Mie theory is essential for more complicated scattering mechanisms, such as those causing the glory.